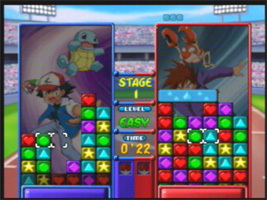 A Pokémon version of Puzzle League, also known as Panel de Pon and Tetris Attack. Fight your way through the Pokémon League by beating the other Pokémon Trainers in Puzzle League games. Colored blocks rise from the bottom of the screen. Switch the blocks horizontally, lining them up into lines of three or more to make them vanish. When they vanish, any blocks above them drop down, giving you time to set up a combo. When the stack hits the top of the screen, the game ends. New to this edition is 3D mode, with the blocks wrapped around a cylinder. This gives you more blocks and no screen edges, allowing for extremely long combos to be pulled off.